The Master Mason cigar band is a traditional classic style ring that has lasted the test of time as being the most comfortable of ring styles. The LVX-C-ARKUS SKULL Masonic band fuses an era of sophistication with a fresh modern appeal in design and hand engraving. Its lavish look metaphorically represents the more divine attributes of Masonic education where allegory, metaphor, and symbolism unite to impart a broader philosophy expanding a viewpoint often beautifying a particular definition or enhancing elucidation of a particular idea in as was the role of mythology. 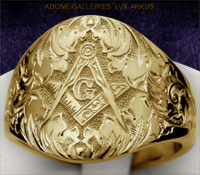 The Arkus Mason skull ring is hand engraved on a continuous curvature unlike flat top Freemason signet ring styles and this curvature enhances its sparkle as light strikes uniformly from all angles its arced surface. 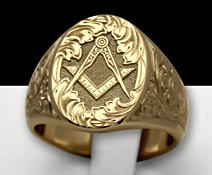 The Arkus line of cigar band style Freemason rings are thick low profile sturdy rings that will last generations and will become treasured heirlooms proudly passed from father to son and from brother to brother. 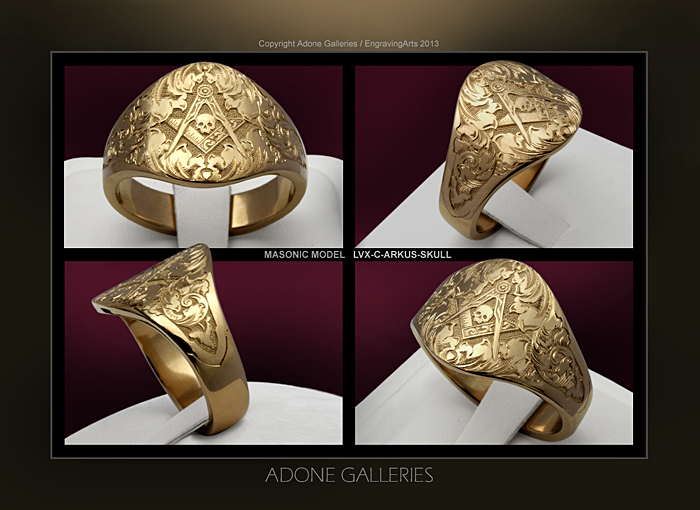 Every ring is produced to the highest quality standards so that every Master Mason ring is handmade, hand engraved and a signed original by Adone Galleries. Luxury jewelry fine hand engraved freemason signet rings, Master Mason cigar bands and custom wedding band ring engravings. LVX-ARKUS, LVX-C-ARKUS-Skull Mason cigar band rings engraved Freemason jewelry, monograms crests coat of arms signet rings.